This may not be the most perfect example, because the cost is the same for FBA Offers and New Offers, but lets push through with it for consistency sake. 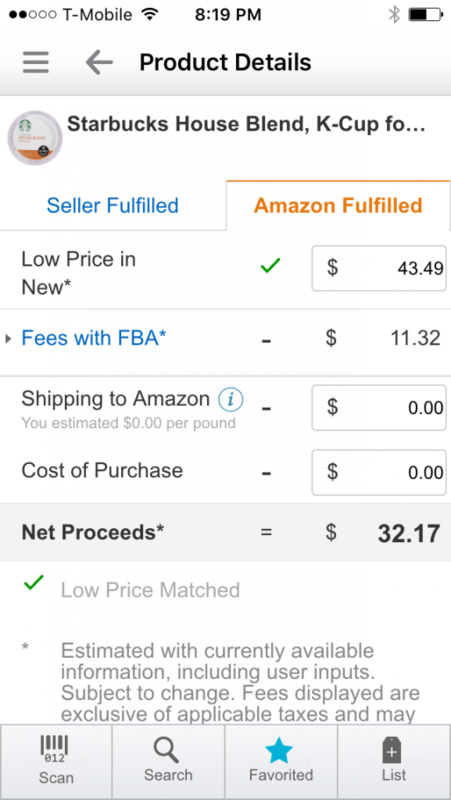 Normally, when I glance at the seller app, I kind’ve do the math in my head to see if its roughly in my target area for margin–and usually FBA Offers sell higher anyway–but, for larger purchases, you really want more fidelity. 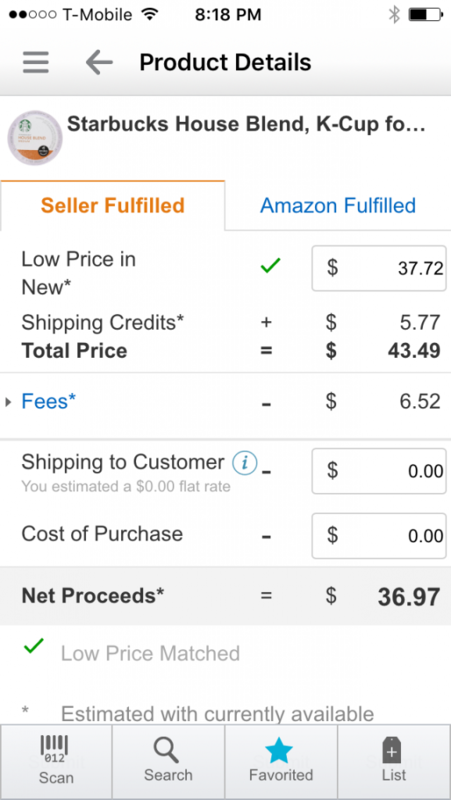 This operates much like the online FBA Calculator that I talked about as one of my useful tools for reselling, in that you can tweak the price and see the resulting Amazon fees. 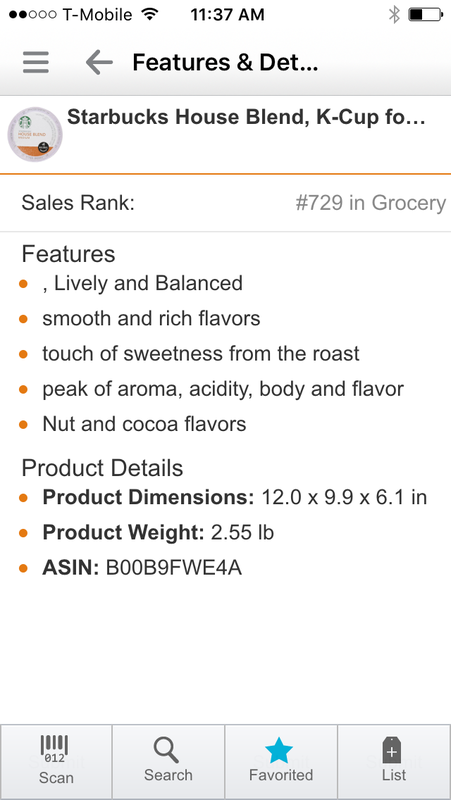 This makes it easy to do a lot of “back of the paper napkin” calculations on your mobile device (aka smartphone). It’s things like this, that I really like about the Amazon Seller App. 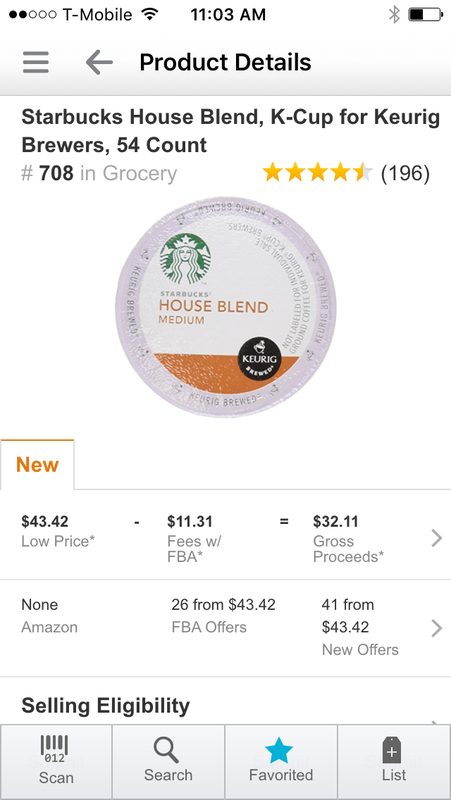 Looking back at that product screen, you may have noticed, there was another arrow. See? So what information do we get when we select that arrow? We get to see the competing offers of course! Like I said, with coffee, you’ll get the same data. 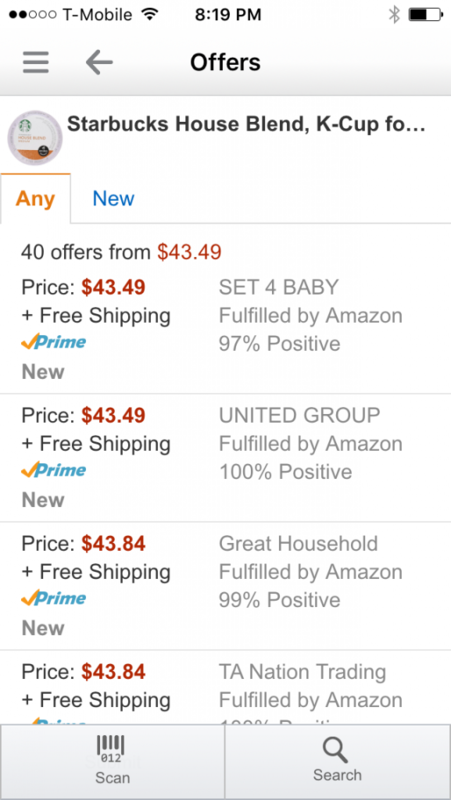 But, you can at least interpret the Prime sellers, vs. the non-prime sellers. 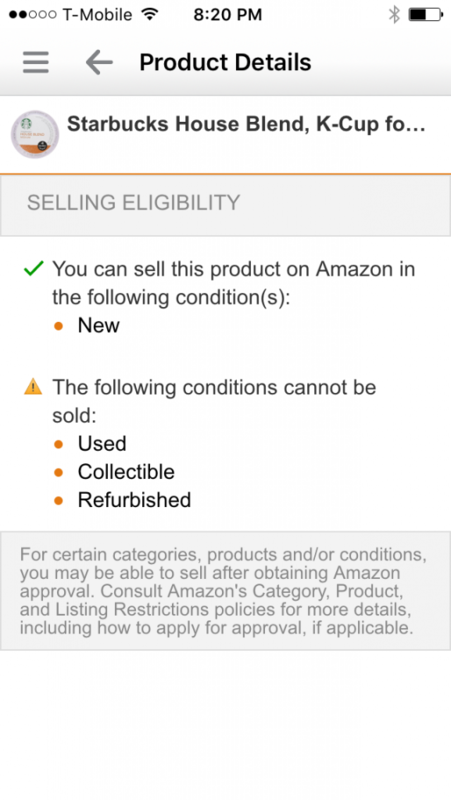 If you scroll down on that Product Details page, you’ll see Selling Eligibility, and Features and Details. 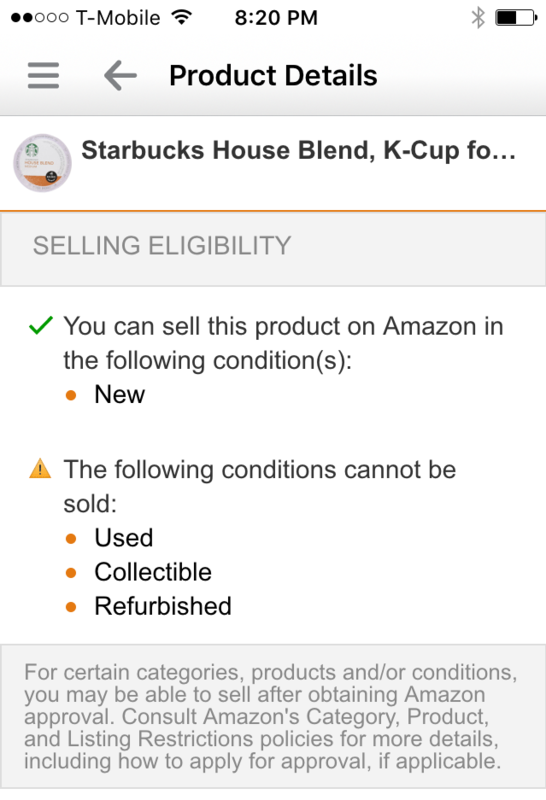 Those may be helpful for you in that you can verify you can or cannot sell the product as new, etc. You may not be thinking this now, but, some high dollar products invariably get returned, and you have to decide what to do with them, if a product can be sold as used or refurbished, then that gives you a back up option. It is never a good situation, but, it is always good to have options. The Amazon Seller App is a pretty powerful tool. I think that’s pretty evident, as you read through both Part 1, and Part 2 of this series on the app. I find that I use this app much more than nearly any other app on my phone, other than e-mail, google/safari, twitter, and slack. 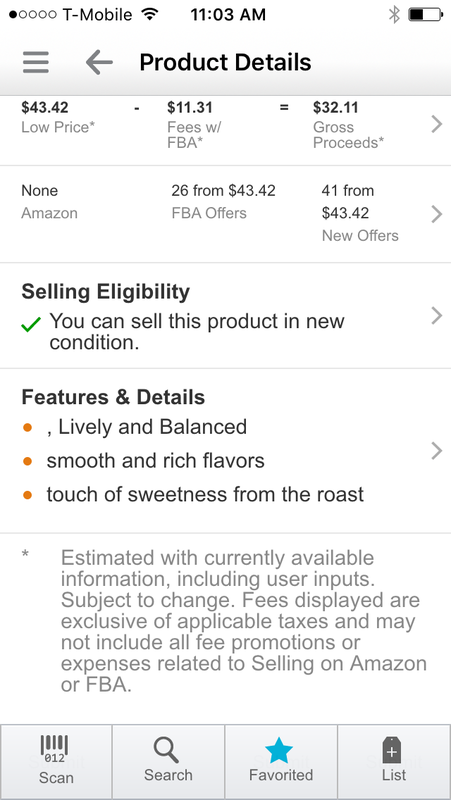 Have you found any other really awesome functions that the Amazon Seller App helps with? I have to disagree about FBA. It has been bad for me. They lost a laptop I was reselling and for weeks gave me BS about it being in transit from one fulfillment center to another. Then when they finally admitted they lost it they said no reimbursement of replacement for 30 days. Another time I sold and iPhone that was returned, FBA did not say why so I requested it be returned to me as it must have been defective. It worked fine but was without the accessories included. I will NEVER use FBA again with their worthless help desk in Mombai.